Not a runner but want to be part of the Servus High River Half? come join our awesome volunteer team! It’s a small, time commitment you’ll feel good about, and you’ll still have the rest of the day to enjoy other weekend activities. Plus all volunteers get to wear and keep one of our amazing volunteer T-Shirts! This position is based at George Lane Park. Duties: Take in pledges, give out race kits, t-shirts & bibs, have participants sign waivers, register new participants. This position is based at one of the many intersections along the course. Have water & Gatorade ready to pass out to runners who go by. Volunteer stops traffic when runners in vicinity. Stop traffic rather than stopping runner. Directs runners in correct direction. This position is asked to take as many pictures of runners as possible. 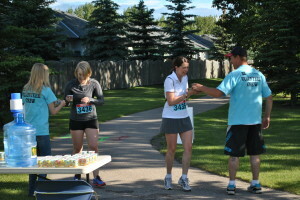 Asked to focus on the scenery, beauty of High River and the runners. This position is asked to play any music that you can think of as runners pass. Lead and sweep the races on bikes.